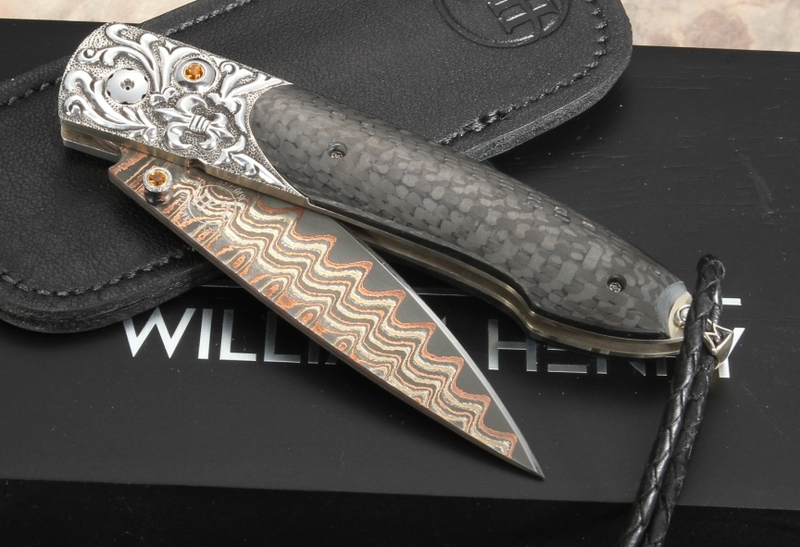 The B10 Auburn by William Henry Studio is a modern combination of carbon fiber handle and carved sterling silver. 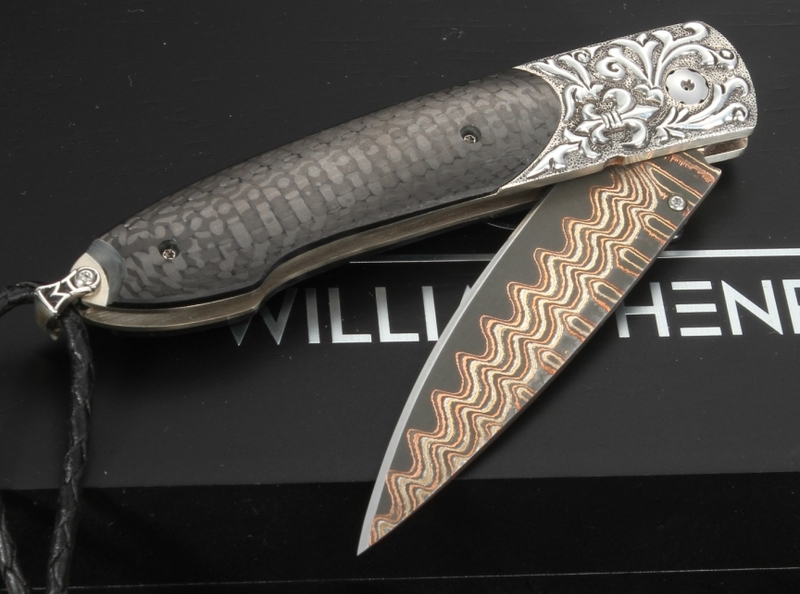 The high-end American made folding knife has copper wave pattern damascus with a cutting core of VG5 steel. The Auburn is a very attractive every day carry carry knife. 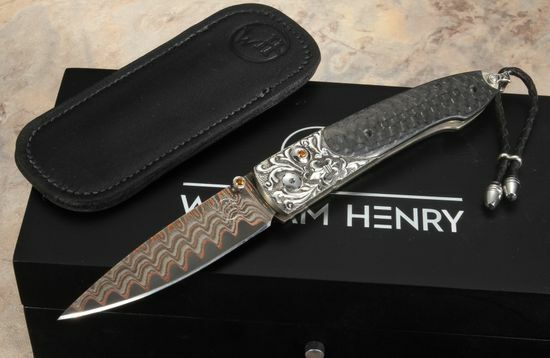 A distinctive feature of this knife is the fleur-de-lis carved into the sterling silver bolster. This William Henry folding knife has a braided leather lanyard with metal beads, and black leather ClipCase for safe carry and easy access. Citrine gemstones are inlaid into both the thumb stud and lock release button. A unique serial number is engraved into the blade and every knife includes a Certificate of Authenticity and wood presentation box. 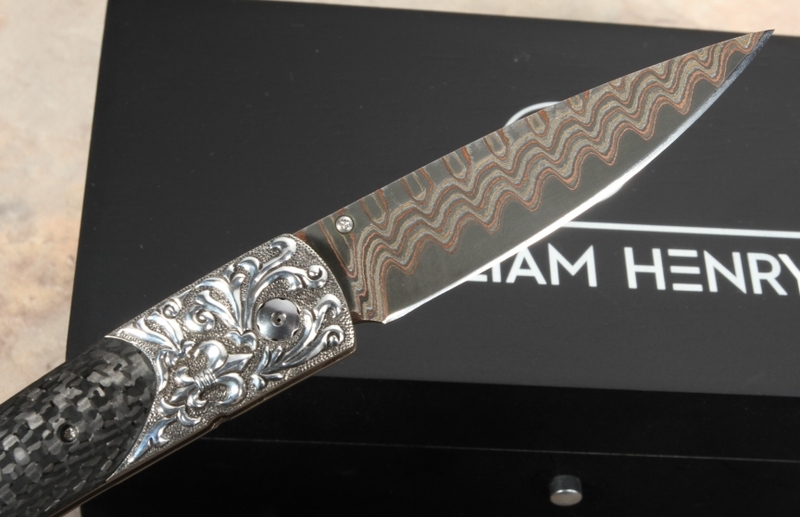 The B10 Auburn is a limited edition knife of 100 items. This was my first William Henry purchase. I'm sure I can't add much to what others already know who own one but, it is the best knife I've owned. The fit and finish, the design itself all more than met my expectations. Had a great experience with KifeArt when purchasing a William Henry knife for a 21st birthday gift. Did quite a bit of research online and KnifeArt is very knowledgeable, has the best selection, great customer service, and competiive pricing. I highly recommend buying from this site!